Looking for private in-home or in-studio Classical Voice lessons? Our Lyndell teachers are ready to get you started. Find your teacher today! Check out some of our most popular teachers near Lyndell, PA including Philadelphia, Wilmington, West Chester, Newark and Lansdale. As a Westminster student, I was exposed to a wide variety of classical music settings and pieces . Voice Performance students such as myself were expected to be able to sing a wide variety of art songs, sacred music literature and arias in English, Italian, German and Latin among other languages. We performed in various venues such as the Kimmel Center and Carnegie Hall and took numerous classes in proper classical diction and performance. As a professional opera singer and recitalist, Rachel uses her first-hand experience in the business to guide her students and to teach them healthy vocal technique. Her students find her to be energetic, warm, and one of her biggest goals is to make her students feel more empowered when they leave than when they arrived. Music is a transformative art form and she hopes to enrich her student’s lives. Learning proper singing technique is essential for the health of singers of all ages and genres. And YES! Everyone can sing! Rachel personalizes each lesson to her students' needs and provides a safe and fun atmosphere that is essential to creative learning. Musicianship, better intonation, breath control, support, tone quality, freedom of sound, and a love of music are all topics covered in voice lessons. I come up with personalized warm-ups for each student and have trained in voice science to be able to identify where a student's specific needs are vocally. I then choose repertoire according to the student's strengths, while still keeping in mind their weaknesses so I may help aid their situation. I am also open to students bringing in repertoire. I combine classical voice technique with broadway techniques. 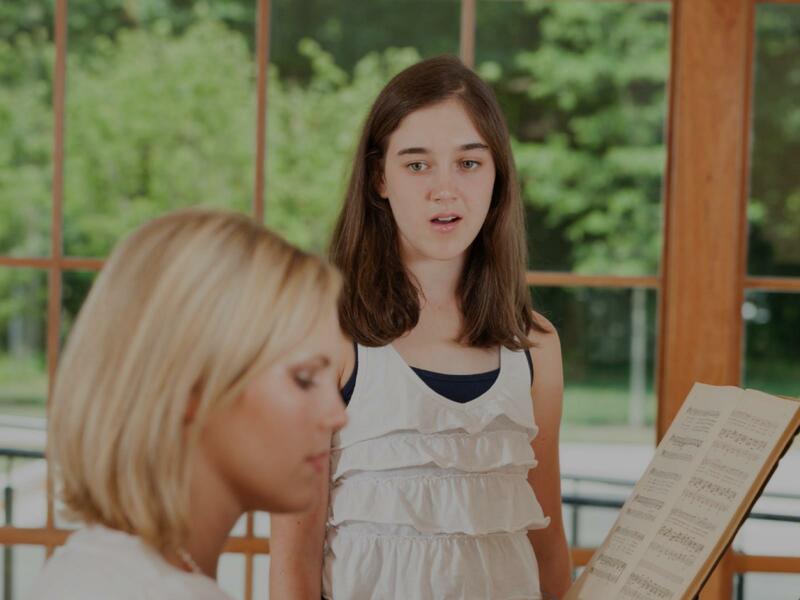 Whatever you are seeking voice lessons for, I am there to help you! I have experience in college audition preparation, school musical audition preparation, PMEA district regional and state audition preparation, and church music. I have been performing for over 12 years in choirs, musicals, solo opera performance, and church worship. I seek to help you gain confidence in performance, and knowledge of your own unique voice and basic music theory and vocal pedagogy. I love working with students of all ages. Lessons may include but are not limited to warm ups (this is where we learn how the voice works, what your body must do to produce a beautiful tone, improve your range, and condition your instrument), working on a piece (sight singing, diction-english, italian, german, french, phrasing, breath control, performance technique, etc. ), and basic music theory (note, rest and interval recognition, time and key signatures, rhythm, etc. Brittany is an accomplished soprano vocalist with much experience in performing.Brittany has two years of college vocal training as well as 2 years of college studio piano training. Brittany has many years of performance experience including musicals, solo performance, and featured solos in oratorio and chamber works such as Jephte by Carissimi, Gloria by Vivaldi, and Mass in G minor by Ralph Vaughn Williams. She has also placed 2nd at the Shepherd University junior vocal competition. Brittany currently sing in a local chamber choir and has been a soloist in their Spring, 2017 season, and sings in the Allegro Christmas Choir. She also loves to lead worship at the local church she attends. unique voice and desires out of their lessons. Brittany is also available for beginner piano lessons. She has been playing piano since the age of 6, and has received formal training at the collegiate level. Brittany focuses on having fun, all the while training students to be excellent musicians. She was great! I'm excited for more lessons with her! She’s so knowledgeable about the subject, and makes my son very comfortable in learning. Recent graduate of West Chester University of PA, holding a master in vocal performance, and being a vocal accompanist at the same time. Earned my undergrad degree in piano and composition, so I have solid piano technique. Teaching emphasized both on techniques and musicianship, and more importantly the talents and interests of each individual student. Approach is tailor made for different students, so as to achieve their potential and develop their love of singing. Can't find a teacher in Lyndell, PA? "Rachel very good My daughter loved I"
Philadelphia, PA teacher: Rachel S.
re than nine months and my range, tone, and technique improved so much. By far best vocal coach I've ever had." our unique vocal talent and ability. She also provides helpful explanations and works with you to find ways of understanding your body that make sense to you. Very intelligent and caring as well. If I still lived in the same city as her, I would be taking lessons with her now!"